December 30, 2014 | Filed under: Krishna! He wanted to be the most powerful person in the world and he was. He wanted all the other Asuras to surrender to him and be his servant, and they did. He wanted all the Andaka and Bhoja and Yadu dynasties to be under his exclusive ruler-ship; he put his father in prison, killed anybody who was in anyway opposing him; he became the king and there was no one in world that could possibly stand up to oppose him. Being the king he had inconceivable wealth; he perfected mystic Yogic Siddhis so that he could perform supernatural feats. He had unprecedented strength; he had everything that he ever wanted, but yet he lived in misery. He couldn’t enjoy any of it because he was constantly worrying about this eighth child who wasn’t even born. Srila Prabhupada tells the story of how maya just knows how to make everyone frustrated, whoever we are. He gives the example of the tiger, the king of the jungle. There is no animal that the tiger is afraid of. 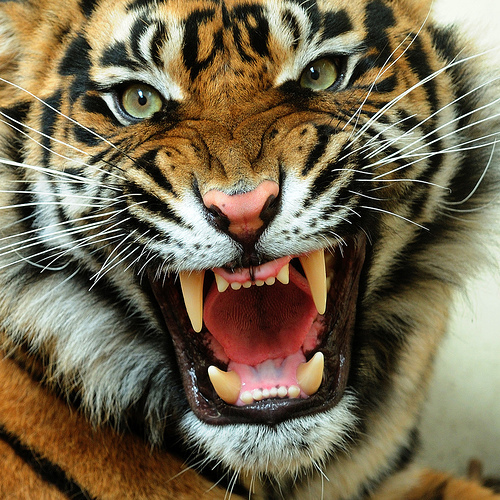 Either you run in fear of tiger or you offer obeisance and pray for mercy. That’s all. The tiger is the strongest; tiger is the king. But yet, Srila Prabhupada said, there is a certain type of tiny bird, very tiny little bird that flies and lands on the tiger’s back. Now the tiger can kill elephants, panthers, everything, what to speak of little humans! But the tiger can’t reach on his back, can’t bite what’s on his back; doesn’t have the Yogic Siddhis to put his claws behind his back. Little bird just rides on his back, and wherever the tiger goes the bird says this little song. And the translation of the song is, “The tiger is coming,” and every animal when they know the tiger is coming they run away before the tiger comes. So the tiger can’t get anything to eat. If the tiger was a vegetarian there would no problem, but he doesn’t eat vegetables; he eats meat. Therefore every animal… And the tiger usually attacks at night. But even little birds have loud voices. “Tiger is coming. Tiger is coming.” As soon as the tiger would come in the neighborhood of the jungle every animal would run away. There would be no deer; there would be no boars, nothing. So the tiger is in total anxiety because he can’t find anything to eat. And this little tiny bird who it’s like chick pet at a tiger as far eating he can’t reach him, there is nothing he could do about this bird. So regardless of being a king with all prowess, still something in this world puts you in anxiety. Kamsa. The more you have, the more you fear that you could lose. His fear was so great; he had renounced all morality to kill six infant babies with his own hands. Just to enjoy his kingdom he was willing to engage in such sin. And he knew philosophy! He was a profound philosopher in theory; he knew the laws of karma; he knew what he was risking in his next lives just so that he can enjoy in this life. This eighth child would be the one that kills him; it was for certain, and he knew it in his heart of hearts. Therefore he saying as soon as he gets this news, “Here is Käla, the supreme time factor, which has taken birth to kill me!” But in his heart of heart due to his attachments he was under illusion. He still had the conviction that he could kill the Supreme Personality of Godhead. That is the extent of the illusion. 32 Responses to "Story illustrating material existance"
Material attachments always keep us in anxeity & illusion. Just theoritica philosophicall Knowiedge will not help us to get out of this illusion. one has to practice it sincerely. Radhanath Swami has explained very baeautifully in this story. Amazing – regardless of being a king with all prowess, still something in this world puts you in anxiety. If Kamsa with proper knowledge of philosophy can come under the influence of Maya, what to speak of human like us! This shows the urgency with which we should take up Bhakti Yoga! No one is free from being humbled and the fortunate one agrees he is not the controller. simple narration easy to understand, Thank you Maharaj for always ensuring that we are spiritually nourished. Very true! All of us are always in anxiety of something or the other. The only solution is to take shelter of the Supreme Lord! Maya can attack us from any corner, who ever we are. Taking shelter of Krishna and His devotees is the only solution to overcome the influence of Maya. Such a deep insight, actually we never think in these lines et..all! How much money,power we have doesn’t matter.but power with spiritually developed people are more satisfied. It is justified and very well explained through example. Thank u maharaj. Very instructive article……In this world everyone is suffering. This scorching heat of material existence is extinguished when we engage ourselves in loving devotional service to Lord. The trancedental teachings of H.H.Radhanath Swami Maharaj always gives cooling effect. Very nice analogy by swamiji. No mater how much powerful u are their will b at least on person on this planet earth to make u frustrate. Lord is the only hope for everyone. The more you have, the more you fear that you could lose. what a beautiful analogy. No matter who you are the material nature will frustrate you. Thank you HH Radhanath Swami Maharaj. HH Radhanath Swami beautifully emphasizes on the helpless condition of material life and the example used is so instructive that even a small bird can make like of a powerful tiger miserable. Same way we see that even a small mosquito can cause use to fall sick with Maleria or Dengue and sometimes even die. The point here is that we’d be miserable in this world no matter what we do to overcome unless we take to the process of Bhakti. The examples above are only few to show the futility this material existence.. I request others to please share few more striking ones. Thanks in advance. We can never be satisfied in material existence. Nice lesson to learn. Thanks to HH Radhanath Swami. Wonderful pastime and lessons from it. Under the influence of Mayadevi, everyone things he will not die. Smokers/boozers see everyday people dieing of intoxication, but Lord in theri hearts would convince them that they will not die. Thanks you very much HH Radhanath Swami Maharaj for this enlightening article. Yes Sumit, you make a very valid point. It’s really amazing that how one’s intelligence totally gets covered and one doesn’t hesitate in doing self destructive acts. Hilarious example of the bird on the back of the tiger but with a deep lesson. Thank you HH Radhanath Swami Maharaj. Such is the effect of this illusion that even the most powerful is bewildered. If only Kamsa had understood the truth of this material world that everyone has to die one day and if only he have had chosen to serve Krishna with Love, he could have made best of both worlds. But what he actually did caused him misery for long and also caused so much distress to so many others. Very instructive discourse from HH Radhanath Swami.